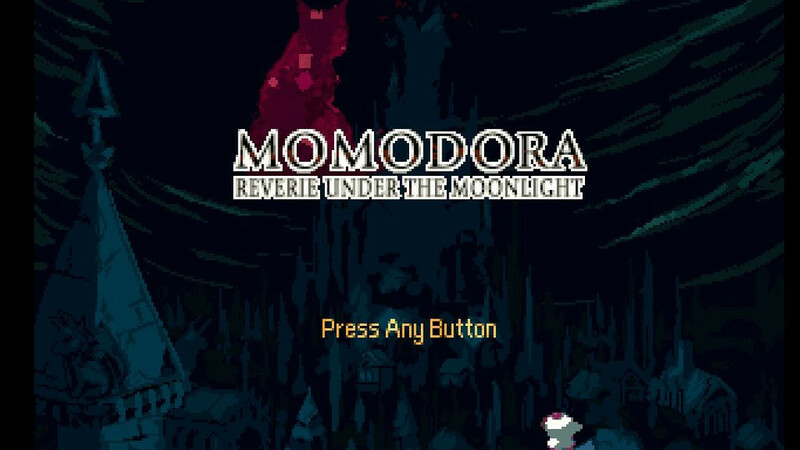 I first bought Momodora: Reverie Under the Moonlight when it released on Steam a couple years ago. Though I enjoyed it after starting it up, I found the hassle of allocating time to set up and play on my laptop to be a bit daunting. As such, I didn’t get that far. But then I saw Momodora was headed to the Nintendo Switch, and despite already owning it, I knew this was the perfect fit for the indie Metroidvania. There’s no setup involved in just playing portably, so I bought Momodora: RUtM for a second time. Was it worth the wait, or should I have beat it on Steam? As a fan of the genre, I was quickly drawn into the world of Momodora. This is a beautiful, gothic world being poisoned by darkness, and only a lone priestess from the village of Lun can stop it. That priestess is named Kaho, and while she is well animated and capable of doing great damage with her trusty maple leaf, I can’t say I knew much about her. 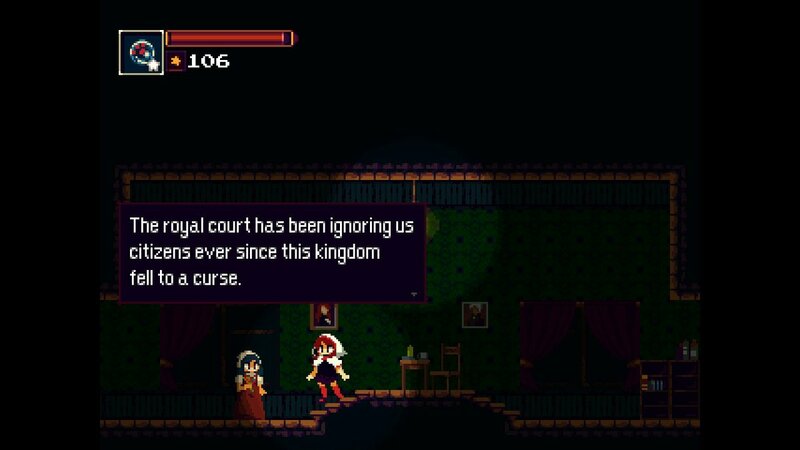 That may be due to the fact Reverie Under the Moonlight is my first experience with the world of Momodora. I haven’t played the other 3 games which preceded it, so there’s a very distinct chance I was missing out on some context fans of the series already had. Regardless though, I can’t help but wish the game had given me a more complete portrait of the protagonist. Thankfully, where the game falters a bit in the storytelling, it more than makes up in the gameplay. Right from the get go, Momodora gives you almost all of the tools you’ll need at your disposal. Yes, Kaho’s weapon is a leaf, but she wields it like a short sword, doing fierce 3 hit combos effortlessly with a push of the Y button. She is also capable of doing powerful aerial attacks with the leaf. For long distance assaults, she’s armed with a crossbow equipped with infinite arrows, which can be fired with a press of the R button or charged for more powerful attacks. For agility, B provides a double jump and A does a dodge roll, which is utterly crucial since it grants temporary invincibility. Meanwhile, the L button is used to alternate between equipped items (of which you can have 3 in your inventory at a time), and they can be expended with X. I was very fond that each item, once found or bought once, had a set number of uses which were recharged whenever you saved your game. That’s a really nice feature that’s lacking in most Metroidvanias, which require you to either scrounge for or buy copious amounts of items. The controls are perfect on the Switch and everything feels natural, which is a good thing, since Momodora is no pushover. Unlike most Metroidvanias, you won’t constantly be leveling up, and though you can increase your starting health, you never really improve your initial stats. What that means is that most every foe in the game can demolish you if you’re not careful. A few well placed hits will put Kaho in the dirt, and that goes double for the powerful and challenging boss fights. Thankfully, the combat in the game never felt overly punishing or unfair. It just quietly pushes you to do the smart thing and learn enemy attack patterns and smartly dodge to survive. I died several times in my first playthrough, and I guzzle Metroidvanias more greedily than coffee. One of the only ways to get stronger is by collecting Crest Fragments. Besides the basic combat, you’re also able to mix things up with your inventory. I said earlier that you can equip 3 items in your inventory, but you can also equip up to 2 passive items at a time. These can do anything, from drawing Munny towards you to increasing your resistance to status ailments. If that wasn’t enough, active items in your inventory have a variety of effects, from healing Kaho to summoning eldritch forces to even temporarily increasing your attack power. So while you by no means have to try the various items out, it’s very much in your best interest to experiment. That said, if you’re a purist like me, you’re more than capable of defeating the game just with Kaho’s leaf and bow. It’s a little hard to explain the platforming in the game. On the one hand, Momodora feels very minimalistic and linear. Yet at the same time, it somehow feels a bit open ended. Sure, you can go wherever you want most of the time, but you’re also driven in the right direction by smart contextual clues. You also will rarely know when you’re around the corner from a boss fight, since they come upon you unexpectedly. Thankfully, most of the platforming is pretty easy. Sure, there are instant death spikes strewn around pretty liberally, but I found those were rarely a problem so long as I didn’t get overwhelmed and rushed through an area. While you won’t get tons of new skills to traverse your environment, the one you do get is quite fantastic. Kaho will eventually be able to turn into a feline using the Cat Sphere, which allows her to access narrow tunnels. Better yet, she’s more than capable of combat while in kitty form. So if you want to get through part of the game as a cat, you’re able to! Just keep in mind, you can’t use your inventory in that state. 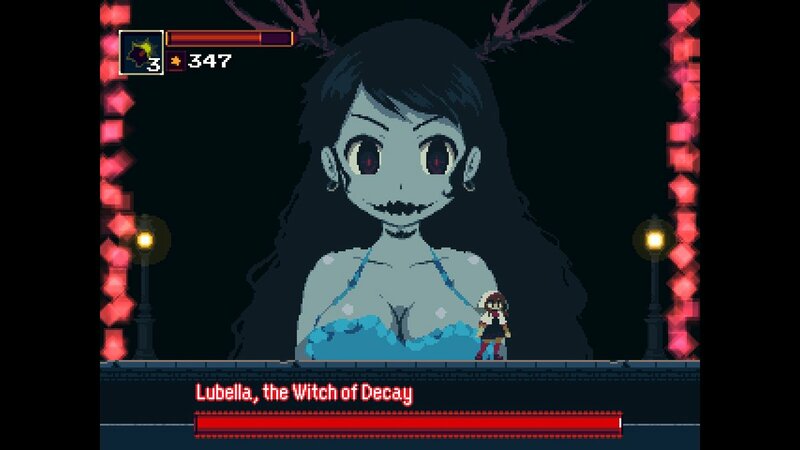 Visually speaking, Momodora: RUtM is dripping with gorgeous pixel art. Honestly, that’s what first drew me to the game, and it doesn’t disappoint. There’s almost a hand painted quality to it, and everything feels very fluid and organic. That goes double for the action, which is very dynamic. I loved the art for the foes and bosses, ranging from cackling witches with fancy hats to ethereal wolves to tiny thong wearing savages. The bosses especially shone, though perhaps my favorite was the Witch Lubella. Rarely have I seen such a marriage of dark necromancy and pillowy bosoms. The music for the game is a bit hard to describe. Most of the game is actually devoid of music, and features more ambient noise such as the grunts of foes as they attack you or the sound of your leaf swishing through the air. The points where the music always shows up are in boss fights, and there it’s ominous and full of energy. Much like the rest of the game, it’s minimalistic but charming. As is often the case in real life, evil witches usually have large bosoms. 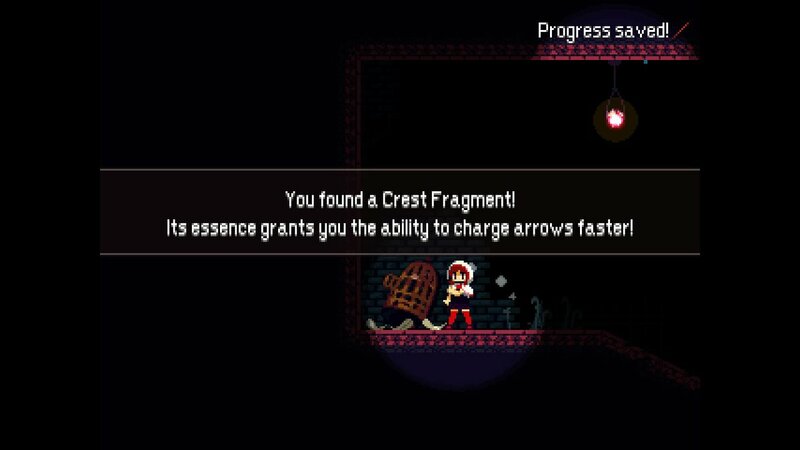 Most of my experience with Momodora was very positive, with one small proviso – it’s an incredibly short game. My first playthrough took 4 and a half hours, and that was with getting 97% map completion. Granted, I got the bad ending the first time, but that only encouraged me to play again, and then I was able to get the true ending in under 3 hours. I’d wager a true speedrunner could beat the game in less than 2 hours, which isn’t to say the game isn’t worth your time, it very much is. It’s just that, as enjoyable as the experience was, I really wanted more of it. More plot, more character development, and more areas to explore. Hell, if they decide to add content via DLC, I’ll be one of the first people to buy it. I enjoyed the game that much. Having said that, there were a couple of minor niggling issues which bugged me. First, while the controls are mapped brilliantly to the Switch, I wish I didn’t have to pause the game to access the map screen. Map it to the ZL or ZR button instead. And a weird issue I encountered was that when I went to load a game and tried to return to the title screen, it wouldn’t respond. So I would have to load it and select Return to Title instead. Other than those, it was a pretty rosy time. All in all, Momodora: Reverie Under the Moonlight was worth the wait. It’s a wonderful experience on Switch that I’d recommend to all fans of Metroidvanias. While it’s true that it is very short, there is a bit of replay value. First, there are two endings to get. Secondly, there are different difficulty settings you can try, if you crave a bit more challenge. There’s also a hidden boss fight and New Game + with added difficulty. Sadly the achievements found in other versions aren’t present here, which is a missed opportunity. While I do wish there was more to do, I can’t deny I had a good time playing it. $14.99 may sound a bit pricey for a short adventure, but I feel it’s worth it. Worst case scenario, you can always pick it up on Switch when the game goes on sale. If you want a short and sweet game to play, you can’t go wrong here.